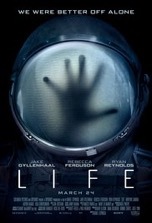 It’s very tempting to call Life a cheap knockoff of Alien and just leave it at that. Actually, Life pilfers from other sci-fi movies too, like the recent Passengers. Both films open with a meteor shower wreaking havoc on a spaceship and end with one male and one female survivor who must save that ship and humanity as we know it. Granted, what lies between those narrative bookends is divergent to the extreme. The Alien comparison is more apropos since the bulk of Life’s story deals with a too strong, too fast and too smart creature that slinks about the ship picking off one cardboard character at a time. Like so many sci-fi and horror creature features these days, there’s no emotional impact when characters die because we have no personal connection to them—a failure on the part of the writers to customize personality traits and construct compelling back stories. But character development isn’t the only area of the movie where screenwriters Rhett Reese and Paul Wernick were derelict. Plot holes large enough to fly a Soyuz spacecraft through bedevil a story that already has problems with pitch and yaw thanks to its derivative storyline and plot contrivances. These contrivances, designed to keep the thrills coming at a rapid pace, are so daft they make you want to throw your bucket of popcorn at the movie screen. Chief among these inanities is the poorly designed exhaust manifolds (or some other such technobabble) on the ship’s thrusters. The creature will enter the ship unless the crew engages the thrusters to flush it out of the engines, but commencing a burn will put the ship on a collision course with Earth’s atmosphere. So the lesser of two evils is to let the creature back into the ship where they hope to kill it, despite the fact that they didn’t even come close to doing so earlier. Utter tripe! The creature design and FX that brought it to life are absolutely spectacular. As such, the creature’s greatest flaw doesn’t come from the drawing board but from the script. Rhett and Wernick, along with director Daniel Espinosa, made the creature too indestructible. The fact that a Martian creature can thrive in an oxygen environment is dubious from the start, but when that squid-like blob can outsmart humans at every turn…on their own turf? C’mon! At the very least, you’d expect the stellar cast to be able to pull the story out of its tailspin, but due to the poorly drawn characterizations, such is not the case. The fact that Ryan Reynolds’ wise-cracking character (a slightly toned down version of the titular antihero in Deadpool) can never keep his mouth shut is ultimately his undoing. Jake Gyllenhaal and Rebecca Ferguson make the most of what they’re given, which isn’t much aside from running and shouting. One of the only things the film gets right is that the black guy (Ariyon Bakare) isn’t the first character to die. However, this one eschewed stereotype doesn’t make up for the virtual procession of tired thriller tropes employed by the movie. Well, there you have it—this is Life or something like it. Actually, due to its hunter/hunted plot, this movie should’ve been called Death. Unless you’re pulling for the Martian creature, in which case the current title works just fine.